Officially Official: Gran Turismo 5 on sale Nov. 24 in U.S.
“Gran Turismo 5 is an ambitious project, with challenges and complexities which have made it our version of the Apollo Space Program! When we created the original Gran Turismo back in 1997, we wanted to set a completely new precedent for the racing genre. With the technological leap onto PlayStation 3, our objective with Gran Turismo 5 was to create another great revolution which would not only satisfy our own high expectations, but would meet or even exceed the anticipation of the fans. 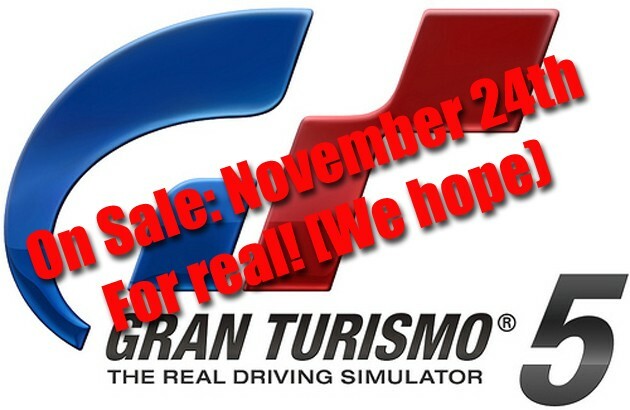 Satisfying the loyal Gran Turismo followers is at the heart of all of our efforts, which is why it was such a difficult decision to delay the release of the game, and one which we did not take lightly. He wasn’t kidding when he says GT5 offers a “wealth of driving experiences.” Even though it’s still two weeks away, we can’t decide if we want to hit the WRC courses or the street courses first. Regardless, our Thanksgiving celebrations just got rearranged. Top tip, Martin!